Look what I found in my unplowed driveway. No, not the utility bill. I put that there so you could see that this print is at least half a foot long. I guess it’s a bear. Or a smallish bigfoot? 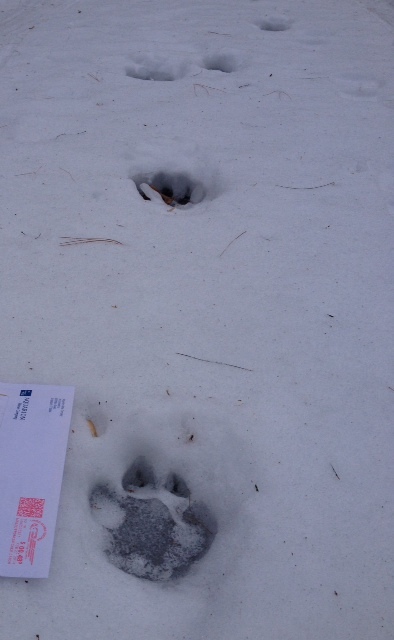 Either way if something with paws this large is roaming around my yard I’d really prefer not to know about it. Unfortunately this winter’s brand of precipitation is perfect not only for turning snowbanks into poured concrete but also for fossilizing big scary paw/foot prints that you wish you never saw. It does make for an exciting dash to the mailbox though.